Israeli forces on Monday struck targets across the Gaza Strip, including the offices of Hamas' supreme leader, in response to a surprise rocket attack from the Palestinian territory, as the military bolstered its troops and rocket-defense systems in anticipation of a new round of heavy fighting with the Islamic militant group. Israel opened public bomb shelters in most major cities and civil defense authorities canceled sports events and public transportation in southern Israel. The Israeli army said at least 30 rockets had been fired into Israel, as air raid sirens wailed across southern Israel late Monday night. The army said nearly all of the rockets were either intercepted or landed in open areas. "Israel will not tolerate this. I will not tolerate this," Prime Minister Benjamin Netanyahu declared during a White House meeting with President Trump. Late Monday, Hamas announced that a cease-fire had been brokered by Egyptian mediators. But shortly after, renewed rocket fire could be heard in Gaza, setting off air-raid sirens in southern Israel. 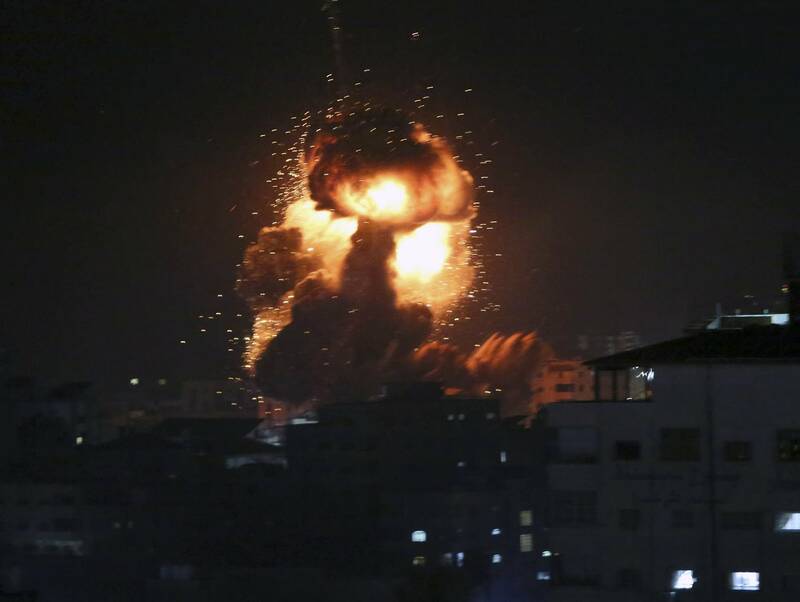 Several airstrikes rocked Gaza, including an explosion that destroyed the office of Hamas leader Ismail Haniyeh. The Israeli military confirmed the bombing, saying the building had "served as an office for many military meetings." An earlier blast destroyed a multistory building in Gaza City that Israel said had served as a Hamas military intelligence headquarters. In Washington to celebrate the U.S. recognition of Israel's control of the Golan Heights, Netanyahu instead was forced to cut short his trip under heavy pressure to strike back at Hamas. Later Monday, Netanyahu remained in Washington past his scheduled departure time, huddled in conference calls with security officials, Israeli media said. Haniyeh issued a statement warning Israel against heavy retaliation. He said the Palestinian people "will not surrender" and its militant factions "will deter the enemy if it exceeds the red lines." Israel and Hamas have fought three wars, most recently in 2014. Although neither side appears to have an interest in another war, fighting could easily spin out of control. The 2014 conflict lasted 50 days and ended with over 2,000 Palestinian deaths, including hundreds of civilians, and 73 killed on the Israeli side. "It will be something on a bigger scale," he said. "He doesn't want a war before elections, but they put him in a corner." The sounds of air raid sirens jolted residents of the Sharon area, northeast of Tel Aviv, shortly after 5 a.m. Monday, sending them scurrying to bomb shelters. Maj. Mika Lifshitz, a military spokesperson, said it was a self-manufactured rocket with a range of 120 kilometers (75 miles), making it one of the deepest rocket strikes ever carried out by Hamas. Netanyahu came under heavy criticism from allies and opponents for what they say has been an ineffective policy containing Gaza militants. He has conducted indirect cease-fire talks through Egyptian mediators in recent months, and even allowed the delivery of millions of dollars of Qatari aid to Hamas to ease harsh conditions in Gaza. Witnesses reported seeing Hamas evacuating personnel from government premises. Hamas also announced that its Gaza chief, Yehiya Sinwar, had canceled a public speech. Other leaders turned off their mobile phones, while Hamas police were seen evacuating their stations.